SIMPLE LUXURIES creams are made without preservatives, potentially cancer-causing parabens or alcohol. Without alcohol to speed absorption, you may find that the creams take a little longer to go into your skin, but they don't dry it or leave it feeling greasy. Honey, glycerine and aloe vera gel moisturize and soothe gently and naturally. 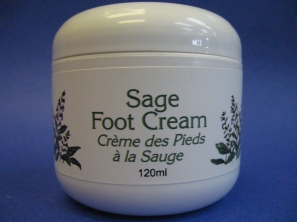 Herbal extracts are used as a main ingredient in the creams. They help the skin balance its own oil and moisture levels so that it becomes actually healthier and better able to look after itself. Olive oil is used to draw beneficial substances from plant material without heat or chemical solvents. Essential oils contribute antibacterial and healing qualities. SIMPLE LUXURIES creams contain no animal products or secret ingredients... because they respect your right to know what you are using. Their labels tell you the whole story. 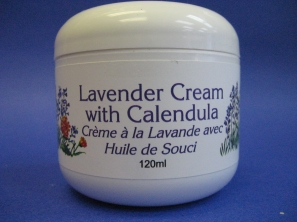 Very moisturizing, a traditional treatment for wrinkles, "age spots" and freckles. An olive oil infusion of elderflowers to rehydrate dry skin, comfrey leaves to soothe and heal, and alkanet root, a natural humectant. Vegetable glycerine and Shea Butter are added to protect skin from drying out again. Also makes a very good sunburn soother. Glorious tea rose scent. Olive oil infusion of calendula and lavender flowers, with essential oil of lavender for healing, coconut and sweet almond oils to soothe, nourish and moisturize, a little beeswax as a barrier against a hostile world. Also makes a superior diaper cream. Fights infections and cracked skin. Olive oil infused with sage, calendula and spearmint to increase circulation. Thickened with natural beeswax. 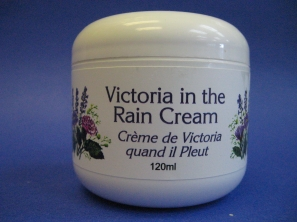 Rich moisturizing cream with calendula oil, Shea Butter, vegetable glycerine, jojoba oil, and their own Victoria in the Rain fragrance. Can be used as a cleanser, toner and moisturizer in one.